ERROR 2006 (HY000) at line: MySQL server has gone away. 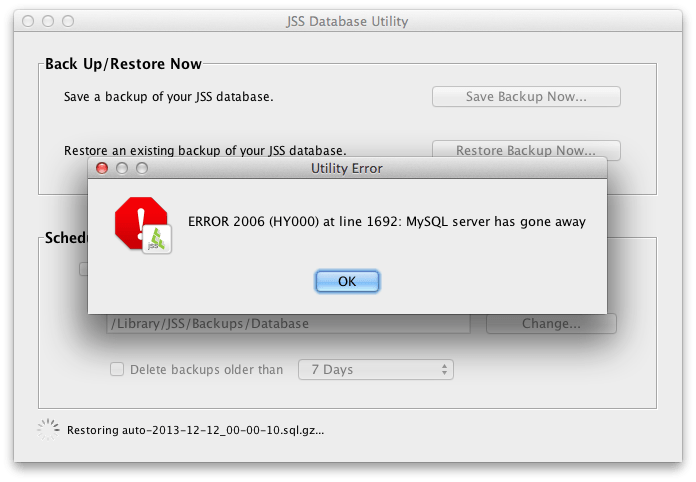 I’ve been trying to restore my JSS 8.73 to a test server in preparation to test upgrading to 9.2x, but during the restore i was getting the error “ERROR 2006 (HY000) at line 1692: MySQL server has gone away” as shown below. A call with JAMF Support & a search of JAMFNation revealed that i’d seen this before & had fixed it.. just hadn’t blogged the fix.. well until a few minutes ago!! The issue was that the MySQL max packet size was set to low for the database changing this to a value greater than the 16MB default from the my.cnf I use as per this post, resolved the issue for me & allowed the restore to complete.